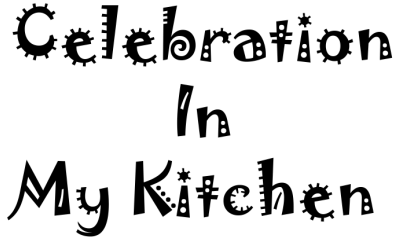 ​With busy schedules, we are always looking for ways and means to cut down on cooking time, simultaneously trying to prepare meals in a jiffy. That's when my masala dabba (spice container box) comes in handy. I rarely use commercial powders, but a brand that I love and trust is Karma Foods which have a whole range of spice mix, all natural with no artificial colouring, preservatives or thickening agents. During my recent visit to Goa, I came across their mutton masala powder and bought a pack to try. It has a recipe on the back, which I adapted for a quick version. As indicated, I have caramelized the onions, which adds colour and flavour to the dish. I have replaced the fresh coconut with maggi coconut milk powder skipping the grinding process and speeding cooking time. The Karma's mutton masala powder has a perfect blend of taste and spice. It compliments the meat while the caramelized onions and coconut powder adds sweetness to the dish. Addition of tamarind water provides the sourness and balances the overall taste of the dish. The powder is subtle in heat so to spice the gravy, you could add some extra green chillies. 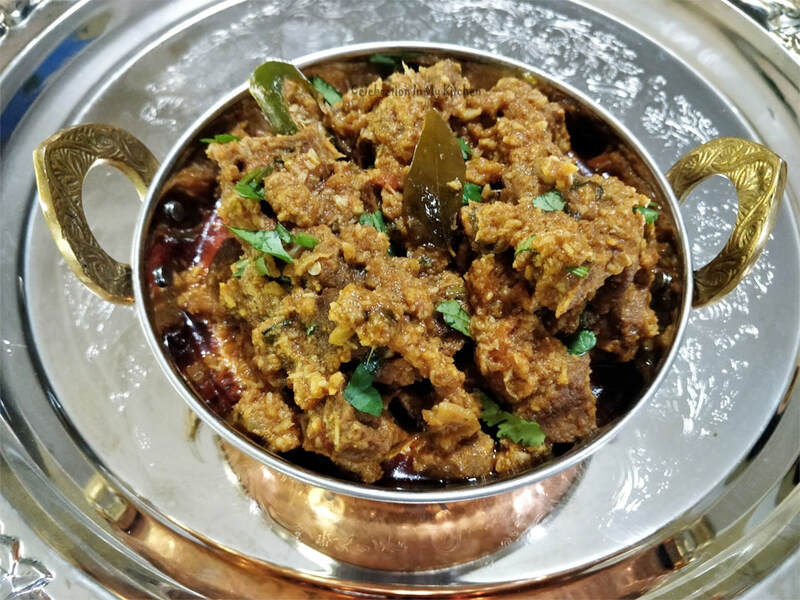 A scrumptious mutton masala that goes well with rice, rotis or bread. 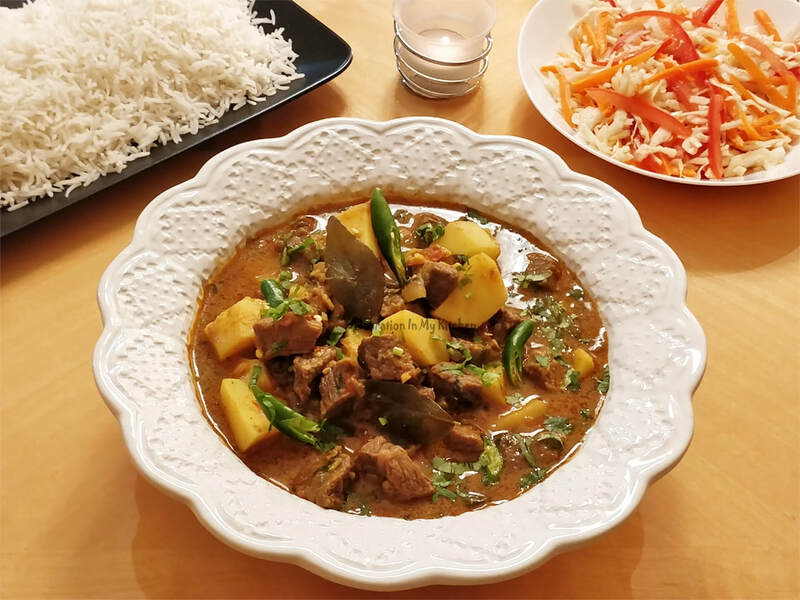 If you are looking for a quick and easy mutton masala recipe, then this is the one. With a few ingredients, you can serve up a delicious meat dish in no time. Instead of mutton, you can use chicken, beef, lamb or mixed vegetables. Wash and season meat with salt. Keep aside. Heat oil in a pressure cooker and fry the onions till brown. Add garlic and ginger, followed by tomato. When tomato is pulpy, sprinkle the mutton masala powder along with the coconut powder and fry well. Stir in the meat and combine with the above mixture on a low flame for 5 minutes. Add tamarind water along with green chillies. Cover cooker with a lid and put the weight. Pressure cook for 30 minutes on medium heat till meat is tender. Run the cooker under a tap of cold water, release steam, remove the weight and open the lid. Check for seasoning, add bouillon cube and salt. Finish garnished with coriander leaves. To make sukka mutton, omit the coconut milk powder, dry out all the liquid and add some grated coconut at the end. If desired, lightly roast coconut before use. 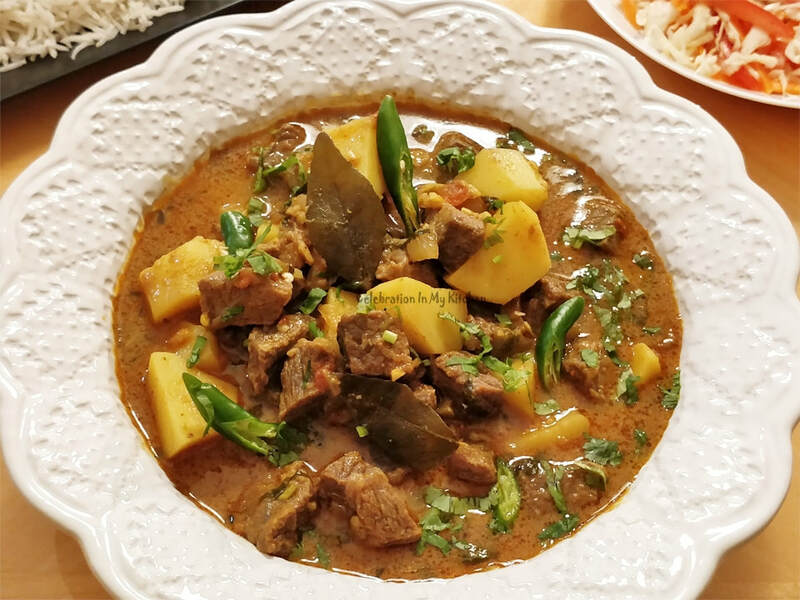 The sukka mutton below was cooked in the instant pot. Follow the first two steps of method. Then, add meat, pressure cook for 25 minutes with only vinegar, no tamarind water and coconut milk powder. Release steam immediately. Then, set to saute until most liquid absorbed. Check for seasoning. Mix in grated coconut and coriander leaves. 1 kg beef cut into cubes and 4 potatoes were used. Add the potatoes once beef is tender. 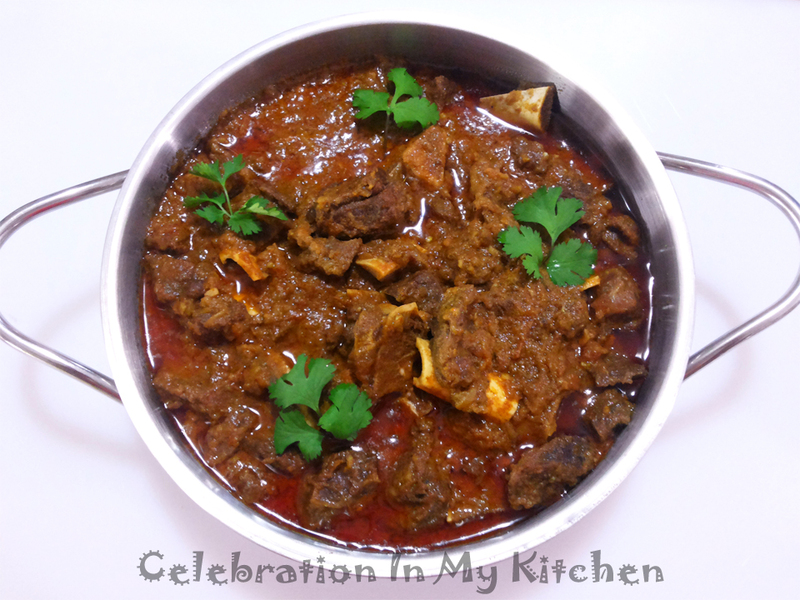 Follow Goan Mutton Masala recipe.